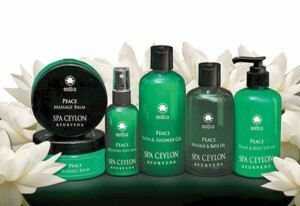 The Spa Ceylon Peace Collection celebrates the new peace and calm of Sri Lanka. The collection is inspired by centuries old Royal well-being rituals performed in ancient Ceylon. The formulae are enriched with 100 percent pure organic essential oils and Ayurveda actives working in harmony to soothe, calm and relax your body, mind and soul. Lemongrass helps calm, refresh and balance the senses, promoting inner peace. Soothing lavender gently relaxes, while spiked lavender helps restore tranquillity. Pure peppermint cools body and helps clarify senses. The blend works in harmony with nature to promote a sense of total peace. The Peace Collection offers a range of Bath and Massage Oil, Bath and Shower Gel, Massage Balm, Hand and Body Lotion, Hand Wash, Relaxing Body Mist and Soothing Balm. The collection features Essential Oil Blend, Aromaveda Luxury Candle, Home Aroma Diffuser, Home Spa Set Travel Set, Harmony Eye Mask Set and Luxury Gift Sets as well. Peace Collection expects to donate 10% of the revenue from the sale of its products to Mother Sri Lanka which is a non-profit movement.